As Apple sold out of its launch inventory of all iPad mini models, online retailer Amazon made a direct assault on the new 7.9-inch tablet, with a large ad on its front page saying the Kindle Fire HD offers "much more for much less." As the iPad mini was available for preorder at Apple's website all weekend, Amazon ran an advertisement on its front page comparing the Kindle Fire HD to the iPad mini. It panned Apple's new, smaller iPad as having a "standard definition, low-resolution display" with fewer pixels per inch than its Kindle Fire HD. Amazon also dismissed the fact that the iPad mini has one mono speaker, while the Kindle Fire HD has dual stereo speakers. Amazon's tablet with a 216-pixel-per-inch screen starts at $199, while the iPad mini has an entry price of $329. 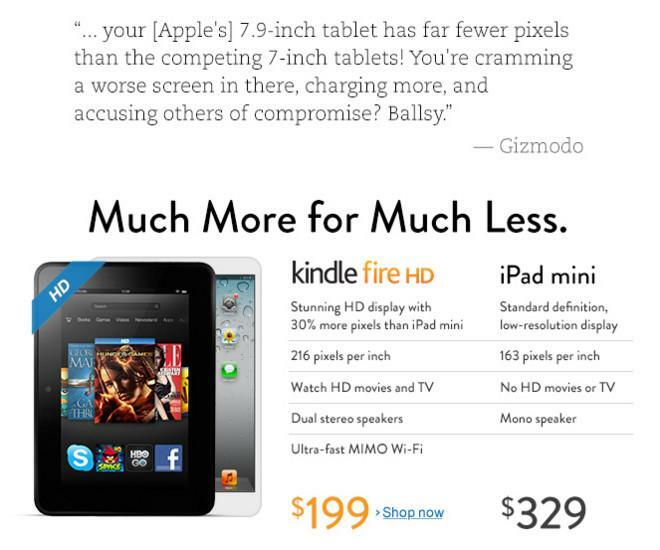 In addition to a short comparison of the devices, Amazon's front page also prominently features a quote from Gizmodo calling Apple "ballsy" for charging more for the iPad mini with a lower resolution screen. Gizmodo and Apple have been at odds since the website purchased a prototype iPhone 4 and disassembled it before the product was announced, while the site also pushed the iPhone 4 "antenna-gate" controversy. Amazon also said that the Kindle Fire HD had its biggest day of sales last Wednesday, the day after Apple announced the iPad mini and its $329 starting price. Sales of the Kindle Fire HD were up three times what they were in the previous week, the company said in a statement to AllThingsD. The online retailer does not release its sales data, so it's unknown exactly how many of the Kindle Fire HD it sold. But the company has consistently said the Kindle Fire is the best selling product on its entire store. Also unknown are how many iPad mini units Apple will be able to build ahead of Friday's launch. But whatever inventory the company will have via its online store has now been sold entirely. All iPad mini models, in black and slate as well as white and silver, in capacities from 16 gigabytes to 64 gigabytes, are all advertise to ship in two weeks. The white and silver model sold out almost immediately, while the entry 16-gigabyte black and slate iPad mini took 35 hours to sell out.